Everyone feels nervous on occasion - it is a natural survival instinct that helps individuals be aware of the environment - but nervousness usually goes away after a while. Anxiety, on the other hand, is a psychological state that is characterized by the intense, persistent feelings of worry. There are many different types of anxiety disorders, including generalized anxiety disorder, panic disorder and obsessive compulsive disorder. These disorders can range from mild to severe and affect your abilities to handle everyday situations like meeting new people and speaking in public. There are several simple steps to take for easing anxiety. It is important to be mindful of the common causes of anxiety in order to recognize the disorder and begin treating it. Anxiety is a mental disorder that develops over time, and is typically set off by a combination of triggers. The primary cause of anxiety disorders in women is hormone fluctuations experienced during menstruation, pregnancy, and menopause. Other factors that can induce anxiety symptoms include high stress, genetics, certain medications, emotional trauma, lack of exercise, and poor diet. Anxiety symptoms can be divided into either physical or psychological. Physical symptoms can consist of sweating, dizziness, increased heart rate, difficulty breathing, muscle tension, insomnia, and headaches. Psychological symptoms can include feelings of dread, intense fear, restlessness, and irritability. There are many different options when looking to treat anxiety. It is important to try out different options to see which works best relative to the severity of your symptoms. Exercising regularly - at least 30 minutes a day - can be very beneficial in reducing stress and releasing serotonin and endorphins in the brain, which improves mood. Low-impact workouts like yoga, walking, and swimming laps are easy on the joints and can help relieve anxiety. Taking time for yourself is key to feeling good and treating anxiety. Getting a massage, reading, and meditating are all effective ways to relax the body and mind. Speaking with friends and family can also help let go of the day's worries and unwind. Making simple nutritional changes can be extremely beneficial in feeling your best and easing anxiety symptoms. Try to incorporate protein, fiber, fatty acids, and fruits and vegetables into your diet for optimum performance and boosting energy. Herbs with sedative properties have been shown to help ease anxiety symptoms, calm the nerves, and promote restful sleep. Chamomile, lavender, hops, valerian, lemon balm, and passion flower are all calming herbs that are popular for treating anxiety. These herbs may be taken as a supplement, or they can be added to a warm bath (i.e., essential oils). If none of the above treatment options work for you, it may be time to talk to a doctor about therapy or prescription medication. Benzodiazepines and beta-blockers are helpful in treating anxiety. On average, anxiety disorders affect 40 million Americans. Anxiety is defined as a mental condition that can inhibit everyday life and affect personal relationships. There are many simple treatment options that have been shown to be beneficial in easing anxiety symptoms. 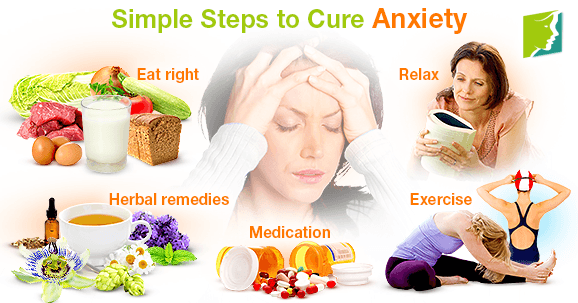 Exercising regularly, eating healthy, and trying herbal remedies are all simple steps to curing anxiety. It is important to try out different options in order to find out what works best for you.